Human Population and Carrying Capacity! - AP Environmental Science! 1. Demographics – The study of human population. 3. Exponential Growth – Population and growth rate both increase. 4. Linear Growth- Population rates increase. The growth rate is steady. 6. Developing Countries – Poor, young, and rapidly growing. 7. Developed Countries – Wealthy, old, and mostly shrinking. 8. Fertility Rate- Number of birth rates per 100 women per year. 9. Total Fertility Rate – Average number of children a woman has in her lifetime. 10.Replacement Level – 2.1 children per couple. 11. Emigration – Move out of an area. 12. Immigration – Move into an area. 13. Life Expectancy – Average age a newborn can expect to attain in any given society. 14. Pronatalist Forces – Factors that increase the desire of children. 15. Antinatalist Forces- Factors that decrease the desire of children. 2. The majority of the world’s population is found in ( developed / developing ) countries. Developing countries. 3. What are the two factors that most affect life expectancy? Morality rates and poverty. 4. Label each of these as example of antinatalist or pronatalist factors. Pro Increased education levels of family. 6. 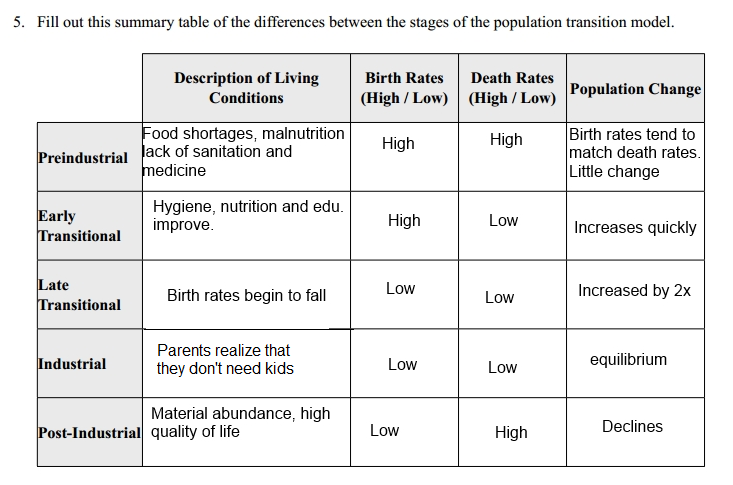 What is an age structure diagram (population pyramid)? Draw a pyramid representing each of the 3 “stages” (Rapid growth, Stable, Declining). An age structure show the diversity of ages in a country.